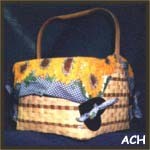 This is really a sturdy constructed tote basket, with a lovely reverse twill pattern inserted twice into the sides of the basket. The perfect bassinett for your baby doll, as a gift to your favorite little girl or to yourself if you collect dolls. A doll rocker that really works. Wonderful for collectors of dolls or for your favorite little girls. Such a neat idea for a door hanging basket. 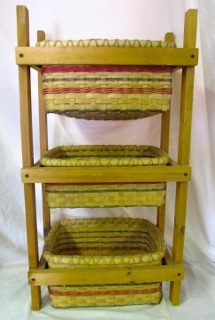 Antique basket used for storage of candles. Accent your home for the Christmas season with this beautifully decorated basket. The perfect size to sit on a table top and hold your favorite doll or teddy bear. Keep your mittens dry and stored away, until you need them. THIS IS FOR THE ACTUAL COMPLETED BASKET and FRAME. Beautiful way to store many things. A nice accent piece for your table. Lidded pot in southwestern design has added metal painted green or red peppers. 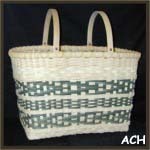 Nice size for carring your supplies to a picnic or potluck. Just a nice all around market type basket for many uses. This is an old traditional basket that was actually used for capturing the feathers while the goose was being plucked.